The Lower Township Police Department promoted one sergeant and welcomed one newly hired police officer and congratulated a recently retired corporal on the April 1 Lower Township Council Meeting. The Lower Township Police Department promoted one sergeant, welcomed one newly hired police officer and congratulated a recently retired corporal on the April 1 Lower Township Council Meeting. 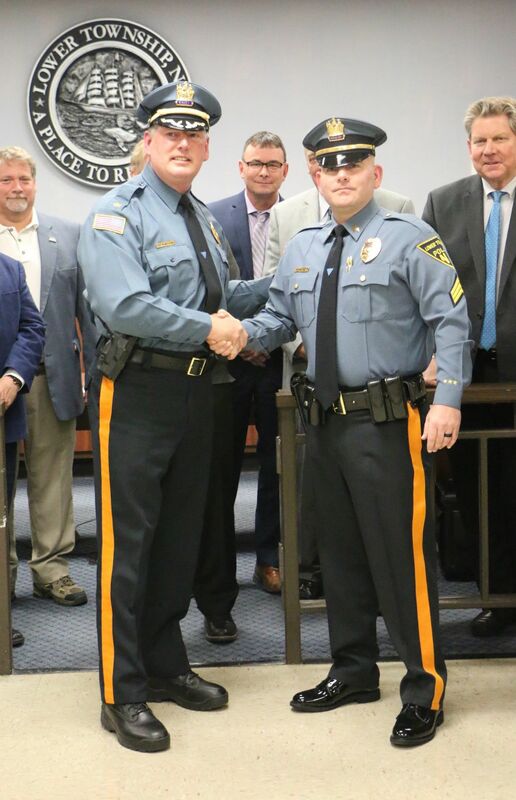 The Lower Township Police Department promoted one sergeant and welcomed one newly hired police officer and congratulated a recently retired corporal on the April 1 Lower Township Council Meeting. Austin Craig is at right. Shaun Wittington is third from right in front row. Between them is Ryan Hansberry. LOWER TOWNSHIP — The township Police Department promoted one sergeant, welcomed one newly hired police officer and congratulated a recently retired corporal at the April 1 Township Council meeting. Ryan Hansberry was promoted to sergeant as his wife, Diana, held the Bible during his swearing-in ceremony. Hansberry is the father of two children, Shaylin and Declan. Hansberry was hired in August 2002 and graduated from the Cape May County Police Academy’s 16th basic course for police officers in January 2003. He served honorably with the patrol division for more than 16 years and previously held the rank of corporal and served as a patrol supervisor and as an assistant squad leader. Hansberry served five years in the United States Marine Corps prior to entering the academy. He served as a sergeant with the 3rd Battalion, 6th Marine Regiment, 2nd Marine Division. Hansberry is assigned as a squad leader in the patrol division. He is a graduate of the New Jersey State Association of Chiefs of Police Front Line Supervision Program. He is also a certified firearms instructor, weapons armorer and field training officer. Hansberry has completed the FBI SWAT School, High Risk Warrant Service Course, M-4 Rifle Operator & Instructor’s Course, Methods of Instruction Course, and has an extensive amount of training in the handling of domestic violence, driving while intoxicated, use of force, emergency vehicle operations and incident command. Hansberry’s badge was pinned on by Lower Township police Chief William Mastriana. Patrol Officer Austin Craig, 25, is a lifelong resident of Lower Township. He graduated from Lower Cape May Regional High School in the Class of 2011. Craig’s former employment was with the Cape May County Sheriff’s Office, where he served since June 2018. He was previously employed by the Cape May County Correctional Facility and has also worked with the Cape May County Prosecutor’s Office. He completed academy class No. 43 in January 2018. Craig completed the Basic Course for Corrections Officers at the Ocean County Police Academy in June 2016. Craig’s badge was pinned on by Cape May County Sheriff Robert Nolan. His father, Walt Craig, held the Bible during the taking of his oath. Cpl. Shaun Whittington was honored on his recent retirement by Mastriana for his 25 years with the Police Department. Whittington started his law enforcement career in January 1994, graduating from the academy in May 1994. Whittington was assigned to the patrol division, where he received multiple commendations and letters of appreciation. He’s been credited with saving a young child from a residential structure fire, administering CPR to a driver who attempted to take himself to the hospital, and reviving a child on the side of the road while off duty. He was promoted to the rank of corporal in January 2011. As a corporal he served as a patrol supervisor and assistant squad leader. He was also an instrumental part of the department and police academy’s training programs as a range/firearms instructor, conducted energy device instructor and physical fitness instructor. Whittington was also an active member and leader on the Lower Township and Cape May County Regional SWAT teams. Mastriana, on behalf of the department, recognized and expressed a deep appreciation to Whittington for his 25 years of selfless service and overwhelming commitment to protecting the citizens of Lower Township.